For the purposes of this article, I’m using the generic term “tupperware” to mean all plastic containers used for storing food even though the Tupperware brand is its own specific thing. Until this weekend, I had a tupperware problem. Though even I didn’t know how bad it was. My parents were in town for a brief visit, and we spent Sunday afternoon organizing and fixing up my condo. I mentioned to my mom that I had accumulated a bunch of tupperware that was currently jammed under my sink, and I asked if she could find a better solution for storing it. Now, this is something I could have done without my mom, but it’s a lot easier to jam more tupperware under the sink than it is to fix the problem. And even if I had taken out all of my tupperware, I probably would have simply organized it once and put it all back under my sink. My mom knows better. Step aside, Marie Kondo. She took out all of my tupperware (which was hiding in many more places than just under the sink), and she laid it all out on a folding table. 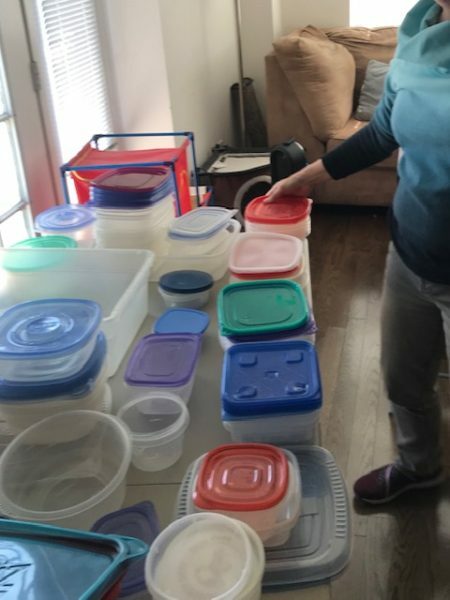 That was the first revelation–I had no idea this much tupperware existed in my condo (there’s even more off camera). Next, she organized all the matching bottoms and all the matching tops. There were quite a few matches, and a few outliers. This is when the second–and biggest–revelation happened. My mom asked me how many tupperware containers I could possibly use at a time. I said around 9 (a few in the fridge, a few in the freezer, a few in the pantry, a few in the dishwasher, and a few empty containers). Woah. I knew she was right, yet it hadn’t ever occurred to me that I shouldn’t keep all of the tupperware. Just because I have it doesn’t mean I actually need it, and if I don’t need it, I probably shouldn’t have it–I should give it to someone who can put it to use. So that’s what we did. We selected around 9 containers (two sets of matching bases/lids), and I’m taking the rest to Goodwill. I did the same thing with glasses later in the afternoon. It felt amazing to rid myself of all that clutter I had accumulated over the years. Have you ever purged tupperware, glasses, or something else that piled up in your house? This entry was posted on Tuesday, April 2nd, 2019 at 9:43 pm	and is filed under personal. You can follow any responses to this entry through the RSS 2.0 feed. Tupperware is the worst. I have purged mine and even just kept one set that was all the same(Rubbermaid) so that it would be “easier” to stay organized but it still turns into a huge mess! The Rubbermaid stacking lids do still make it a little easier but not much. I just hate Tupperware! It truly is a separate job in the kitchen to maintain containers. I dread the day my kid gets old enough to start using them and ruins my system. A few years ago, we switched from plastic to pyrex. So we have very few of the plastic kind of containers now, just a few tiny ones and a few very big ones. As someone who has leftovers for lunch every day, I didn’t like the idea of microwaving plastic all the time. The nice thing about glass is that they are more versatile (Oven, microwave, dishwasher (Top or bottom) are all ok.) But it comes at the expense of storage space, since the glass don’t nest as well as the plastic. but we have a whole large drawer for them, with a lid organizer basket. We have a lot of them. Maybe a dozen serving-sized containers, and another dozen large containers. But there are times where they are almost all in use. We could probably stand to purge the lids. I think we have more lids than dishes, since a few dishes have broken over the years. I like the idea of switching to glass/pyrex, specifically for the microwave reason you mentioned. I need to go through my collection of containers– I have a mixture of a few different sets of plastic (everything DOES have the matching lids and bottoms still), as well as at least 2 full sets of Pyrex glass containers with lids. My plan is to keep the best set of plastic containers, as well as just 1 set of Pyrex, and then everything else will be donated. So your Condo got Kondo’ed, eh? eh? So weird how you get in my head. My housemate literally bought four sets of rubbermaid for the house today, to make up for allowing food to go rancid in several of my containers and ruining them. I cook a LOT and make enough for several meals at a time, and also keep lots of fresh vegetables for my kid that I transfer to rubbermaid instead of the crappy bags they come in. So at any given moment there will be an assortment of 10-12 rubbermaids in my fridge. I never put them in the freezer, they get brittle and easily break. I ALSO keep a supply of ‘don’t care’ rubbermaids that are much cheaper, that way I can give extra lasagna/chile/chicken soup/BBQ sauce to my friends and family, without worrying about getting the container back. But my housemate took most of those to work over the course of a few months and they got thrown out. Those were the other two sets. I have a large cabinet dedicated exclusively to the rubbermaids and keep track of ALL my pieces. I even developed a system of rotation that ensures the most recently cleaned containers get used last. I’ve always been like this. I know it’s crazy from the outside. Adrian: I’m impressed by your organizational system! It sounds better than my “cram them all under the sink” method.